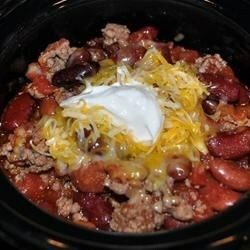 "Southwestern style chili with chipotle peppers and beef. The chipotle peppers add a nice smoky flavor to this dish. Spice it up or spice it down, it's up to you. You can find chipotle peppers in the Mexican specialty aisle in the supermarket or at a Latin grocer. Make sure to purchase the chipotle peppers in the can with Adobo Sauce. Serve with sour cream and cheddar cheese." In a large saute pan, brown ground beef with onion, chipotle peppers and 3 tablespoons of the adobo sauce; drain well. In a large stock pot, combine beef mixture, stewed tomatoes, kidney beans, Kosher salt, ground cumin, garlic powder and chili powder. At this point, adjust to taste with hot pepper sauce. Heat through and serve garnished with Cheddar cheese. This recipe is wonderful to start with and shake it up a bit according to your mood. I like to add grated zucchini or spinach to add some veggie goodness! very good very spicy and I love spicy I added more chipotle for a better chipotle taste and it was GREAT!